DRAGON DUKE staged a remarkable from-last-to-first performance to mark his Singapore debut at Kranji here tonight. Having been placed over 1400m and 1600m in New Zealand but still a maiden, the son of Bachelor Duke was the rank outsider in the Class 4 Premier event over 1000m on the polytrack. 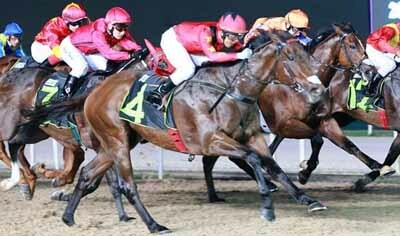 DRAGON DUKE trailed the 12-horse field right till the top of the straight but, under apprentice Chin Chee Seng, he put on "wings" in the home stretch to claim victory by one length. He paid $679. "It was a big surprise he won over 1000m first-up. He reminds me a lot of Secret Win who had similar form from New Zealand," said trainer Daniel Meagher. "I’m still learning about him and tonight really taught me a lot about him. He is a horse I also own and he definitely wants further." DRAGON DUKE raced four times at three for two seconds and a fourth. He was unplaced in one run at four before heading for Singapore. Jockey Ryan Curatolo landed an early double on AUSPICIOUS DAY and MYSTIC PRIDE before a seemingly harmless fall on LIM'S RHYTHM on the way to the start of Race 4 cut short his evening. The former Macau based jockey was taken to hospital where he was diagnosed with a fractured his right foot and will be out for four to five weeks.